we’ve recently updated our Google Compute Engine quotas page. Now you can easily see quota consumption levels and sort to find your most-used resources. This gives you a head start on determining and procuring any additional capacity you need so you hit fewer speed bumps on your road to growth and success. We’ve also improved the process of requesting more quota, which can be initiated directly from the quotas page by clicking on the “Request increase” button. We’ve added additional checks to the request form that help speed up our response processing time; now most requests are completed in minutes. With these changes, we’re making it even easier to do more with Cloud Platform. You can access your console at https://console.cloud.google.com and learn more about how GCP can help you build better applications faster on the https://cloud.google.com web page. 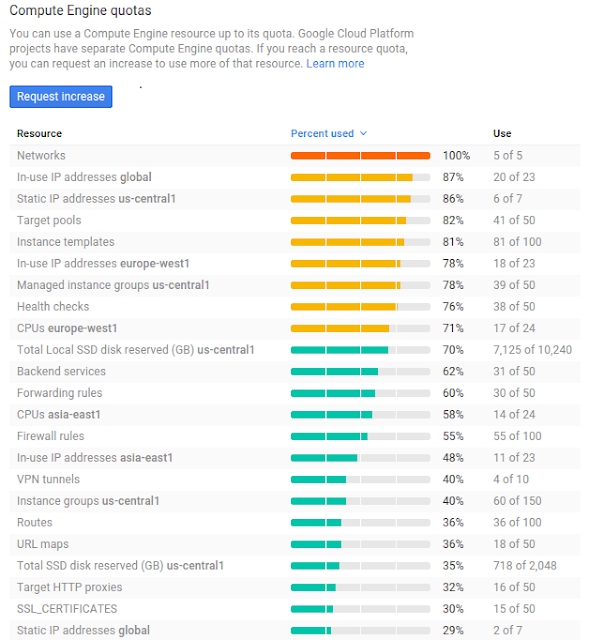 As part of our constant improvements to the Google Cloud Platform console we’ve recently updated our Google Compute Engine quotas page. Now you can easily see quota consumption levels and sort to find your most-used resources. This gives you a head start on determining and procuring any additional capacity you need so you hit fewer speed bumps on your road to growth and success.